With a visit back to family and friends in England this month, I am trying to be organised and starting to think about (eek!) Christmas. Every year I buy charity Christmas cards because I like to help a good cause. So I’m particularly interested in these charity Christmas gift tags. They’re just what I need at the moment and look delightful too. Mecollie Designs was founded by two Brisbane mums to provide stylish celebration stationery at affordable prices. This year they are donating all proceeds from sales of the Christmas Gift Tags to HeartKids – an Australian charity which supports families of children with heart disease. HeartKids also gives cardiologists and researchers financial support to assist with ongoing research and management of children with heart disease. 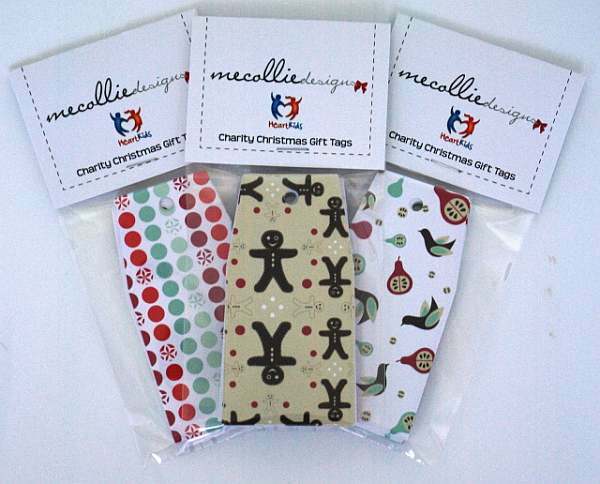 So when you buy Christmas tags this year, why not help a worthwhile charity and get these gorgeous looking ones? Check out the video below to find out more about the work of HeartKids. Each pack of twenty assorted tags are available in five designs and cost $5.5o from Mecollie Designs. Special reduced postage is available for gift tag only purchases.